The idea behind bots dates back to Alan Turing ’s early research on computing machinery and intelligence in the 1950s. Turing laid out the idea behind what is now known as the Turing test , whereby a human and a computer would interact entirely by written messages. Turing posited that if the human recipient couldn’t tell the human and the computer apart, then the computer should be labeled as intelligent. The potential uses for bots are tremendous given the breadth of potential applications. Over the past few years, most bots just delivered information to the user in a question/answer format and were not truly conversational. A user interacted with the bot, and it pulled data from its own database and surfaced it to the user. An example of this kind of bot is the North Face bot , which helps customers find the right jacket based on inputs that are specific to their plans—in other words, location, climate, projected activities, and so forth. 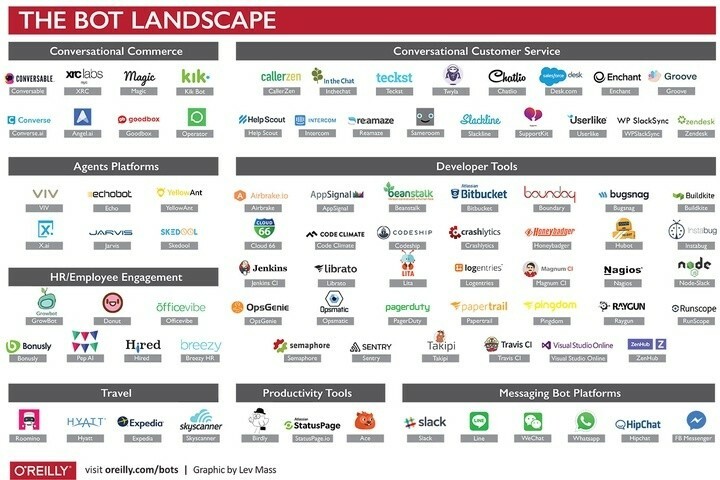 Currently, most of the focus on bots is on messaging apps. Users’ time spent in messaging apps has recently surpassed time spent in social networks . More than 2.5 billion people have at least one messaging app on their phones. The market for bot applications is huge and will parallel the pool of users already using chat as a channel to interact with friends and family. Why not use it to complete tasks in your daily life? When you have a channel that gives you access to more than a billion people , developers start to take notice. Most business models for chatbots are still emerging, but as we look to Asia—where WeChat has hundreds of millions of users—we find applications that let you transact within WeChat . Even though it is still early for ecommerce in chat applications, we are seeing interesting use cases, such as selling children’s books and apparel. In these use cases the brand is making a personal appeal to their consumers in chat. In the modern economy, we are all presented with the paradox of choice ; bots are a great application to help surface actionable insights or refine our options and take action. Amazon is leveraging this power with Echo , to help people seamlessly interact with commerce and their world. In doing so, it also nicely helps people transact on Amazon. By removing the need to look at prices when you order by voice, Echo abstracts the desire for the product from the cost, even as—in some cases—the cost is slightly elevated to compensate for the ease of ordering.The more seamless integration of voice ordering also increases velocity of commerce done through the Echo. As with all services, there is no free lunch.